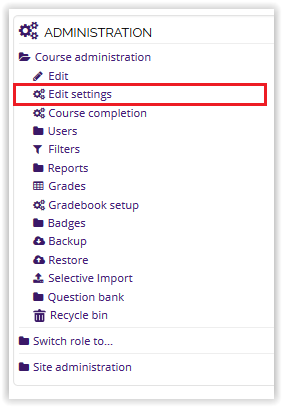 Moodle allows instructors the option to hide their gradebook from students within a given course. This will remove the Grades link in the Administration block for students. 1. Log in to Moodle, and open your desired course. 2. Under the Administration block, select Edit Settings. 3. Locate the Show Gradebook to Students option under the Appearance drop down, and select No. 4. Click Save and Display at the bottom of the screen. 5. To show the gradebook again, change Show Gradebook to Students to Yes.